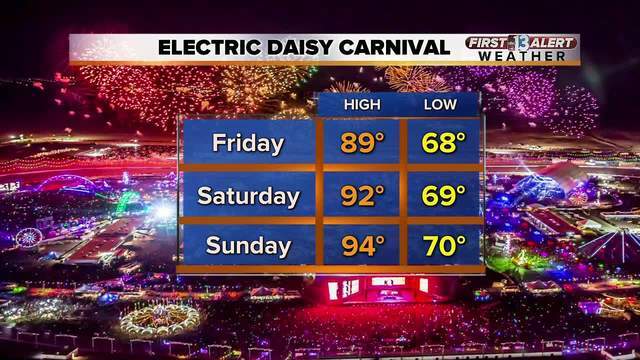 The Electric Daisy Carnival is this weekend, about a month earlier than previous years. The electronic dance music festival will take place at the Las Vegas Motor Speedway May 18-20. The parking lots open at 2 p.m. while the pre-party begins at 4 p.m. and the full grounds open at 7 p.m. The festival ends at 5:30 a.m. The earlier date of the festival means temperatures should be more favorable than previous years when temperatures would reach 110 degrees plus. The forecast for this weekend has highs around 90 degrees with lows around 70 degrees. Expect a lot of traffic at the Hollywood Boulevard/Speedway Boulevard exit on Interstate 15. Traffic should also be heavy on Las Vegas Boulevard, an alternate to get to the concert. While there are no closures on I-15, the Nevada Department of Transportation is closing U.S. 95 at the Spaghetti Bowl for Project Neon from midnight May 18 through May 21 at 4 a.m. During the closure, they will be working on constructing a new bridge for the project. Northbound U.S. 95 to Martin Luther King Boulevard. EDC Las Vegas also has a shuttle to get fans to the venue. More details can be found here . Looking to find the latest details on the festival? Check out EDC's website .